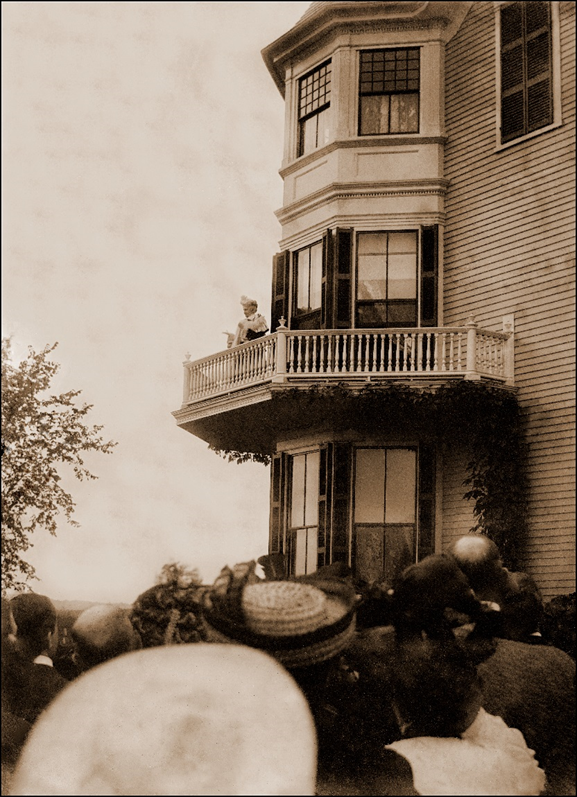 Mrs. Eddy addresses the crowd from her Pleasant View balcony on June 29, 1903. Photograph, P0032, Longyear Museum collection. 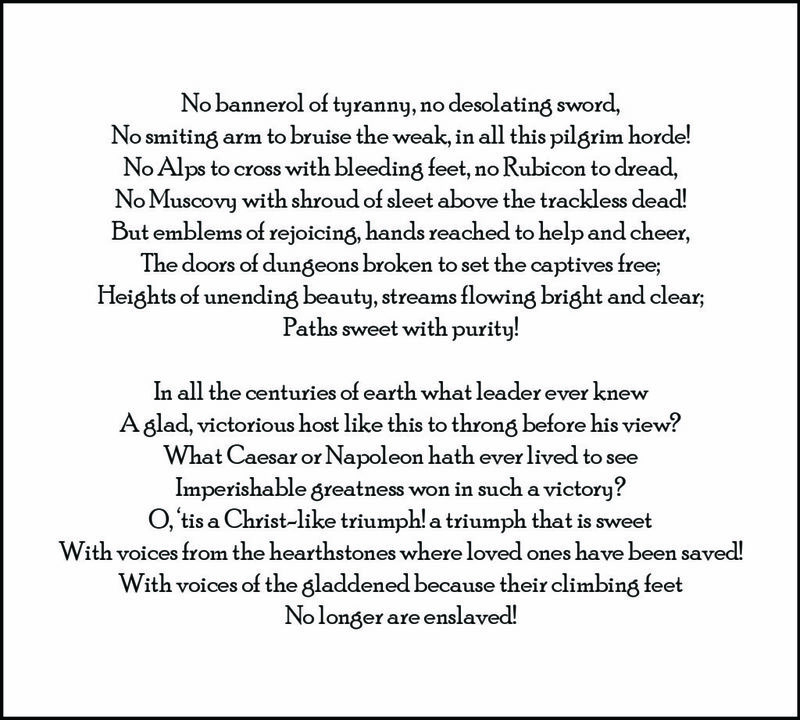 And guide men’s feet to paths of peace, through centuries unborn! That floats around the world! Following the annual Communion service of The Mother Church the previous day, Mary Baker Eddy had surprised the congregation with an invitation to her home in Concord, New Hampshire. Like most of the others in attendance at the service, Mr. Buskirk had jumped at the opportunity to see Mrs. Eddy even for “a moment only.” Taking a train north from Boston to Concord, he joined the “greatest throng of guests within the city gates which has ever been known in a single day.”3 As was the case with so many in the crowd, the path that brought him to Pleasant View, and to Christian Science itself, began with a healing. In 1895, Clarence’s life took an unexpected turn. For many years his oldest daughter had been an invalid, requiring constant care and attention. Clarence and his wife took Ella to sanitariums and mineral springs in the United States and Europe, as well as to the best physicians, but to no avail. A practitioner was engaged and began treatment, and within a few weeks Ella was well. Still, this didn’t convince him. Clarence Buskirk’s legal training – his scrupulous nature, keen communication skills, and ability to reason analytically – would quickly prove to be an asset to the Christian Science movement. Defending the constitutional rights of American citizens, particularly those practicing Christian Science, became a priority for him. In early 1901, when Indiana was considering a bill restricting the practice of any type of healing method outside the established schools of medicine, Mr. Buskirk watched the proceedings closely. Despite such strong opposition, the bill passed. Clarence kept a sharp eye on the new legislation, relaying his own thoughts on the matter back to Boston, and ultimately to the rest of the field through the Christian Science periodicals. “The utter futility of attempts to curtail individual liberty through legislative enactment is once more apparent in the field of medical legislation,” the editors wrote in a brief introductory note telling of the acquittal. In addition to his legal acumen, Mr. Buskirk’s other great gift was his way with words. Already a widely-published poet and author before he became a Christian Scientist,23 his literary talents found a new outlet thereafter. Over 80 of his articles and 15 of his poems were published in the Christian Science periodicals, along with about two dozen reprints of articles originally written for other newspapers in his capacity as Committee on Publication. On June 10, 1906, the dedication day of The Mother Church Extension, Clarence wrote an impromptu poem. That evening, when asked by reporters about his thoughts on the proceedings, he went silent, smiled, and handed them a copy of his words. A witness to this morning century. When Europe woke beneath his eloquence? This photograph of Clarence Buskirk ran alongside his poem in the Boston Herald on June 11, 1906. Clarence responded with sincere gratitude. 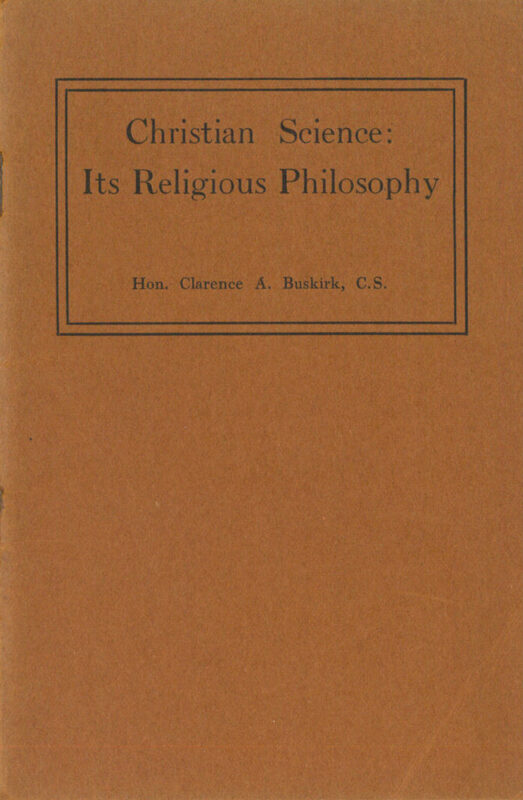 Clarence Buskirk’s lecture “Christian Science: Its Religious Philosophy” was published in pamphlet form in 1909, and later reprinted in the Christian Science Sentinel, April 1, 2014. Longyear Museum collection. 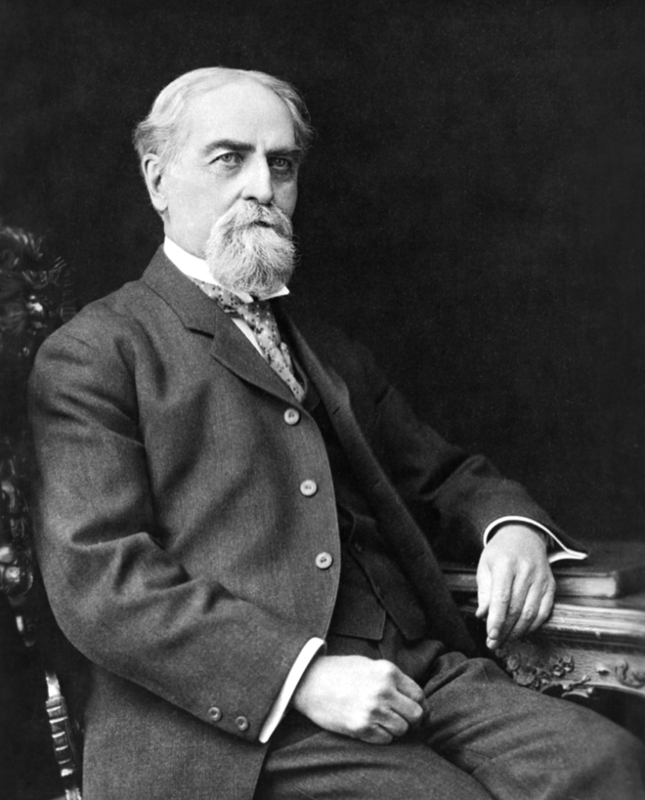 Clarence, who had declared himself “glad to receive any critical suggestions by which I may improve my work in the good fight,”30 heeded Mrs. Eddy’s advice. Soon, she was lauding his efforts. According to one Irish newspaper of the day, Clarence Buskirk “stood with an erect and senatorial air. 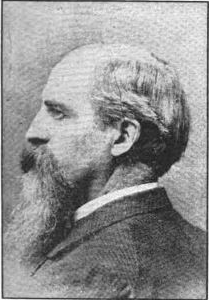 He had the aquiline nose and grey goatee beard usually associated with the characteristic New Englander.” The Mail, November 9, 1907. Photograph courtesy of The Mary Baker Eddy Collection, original in The Mary Baker Eddy Library. In 1915, Mr. Buskirk stepped down from the lecture circuit. 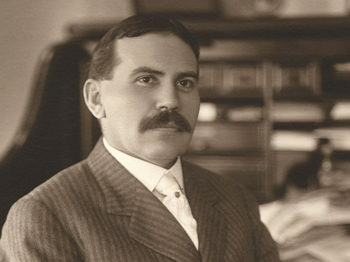 Clarence Buskirk continued to serve the Cause of Christian Science until his passing in 1926. “10,000 Pilgrims to Visit Mrs. Eddy Today,” Boston Post, June 29, 1903. “Mrs. Eddy Spoke: Visited by 10,000,” Boston Daily Globe, June 29, 1903. Clarence was much younger than his older siblings. In 1850, Clarence was 4 years old, Jerome was 13, Hollis was 16, and Charles, the eldest, was 18. 1850 United States Federal Census. James Tartt, History of Gibson County, Indiana (Edwardsville, Illinois: Jas. 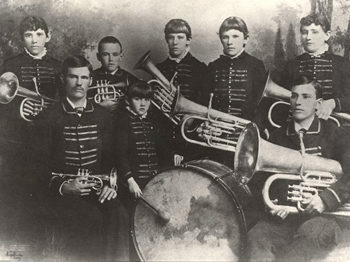 T. Tartt & Co., 1884), 174. See also R. E. Banta, Indiana Authors and their Books: 1816-1916 (Crawfordsville, Indiana: Wabash College, 1949), 48. Clarence’s first case involved defending three men charged with the crime of arson. He cleared their name, and as a reward took home $50 and a gold watch. History of Gibson County, 174. Ella was born in 1868. Zelia was born either later that year or at the beginning of the following year. 1870 US Federal Census. Agnes was born about 1875. 1880 US Federal Census. Zelia and Ella would go on to become Christian Science practitioners (Zelia had Primary class instruction with Mary Kimball Morgan), and both sisters would later live together in St. Louis, Missouri, across the street from the Principia School. Christian Science Business Committee report to The Mother Church, 179b.31.059, The Mary Baker Eddy Collection, The Mary Baker Eddy Library (hereafter referenced as MBEL). History of Gibson County, Indiana, 174. “Why He Accepted Scientist Faith: Judge Buskirk to Tell How He was Converted to Eddy Doctrine,” Helena Daily Independent, March 29, 1908. Clarence A. Buskirk, “The Doctrine of Christian Science,” Christian Science Sentinel 5 (April 4, 1903): 487-488. “The Lectures,” Christian Science Sentinel 6 (March 19, 1904): 455. Clarence had many prejudices before picking up the study of Christian Science, such as his attachment to the concept that inductive reasoning based on physical facts afforded “the only reliable means of acquiring truth. . . .” But these prejudices were quickly dropped after reading Science and Health. See Clarence A. Buskirk, “Methods of Reasoning as Used in Christian Science,” The Christian Science Journal 22 (October 1904): 399-400. Many of Mr. Buskirk’s comments and articles for the Indiana papers were republished in the Christian Science periodicals. See Clarence A. Buskirk, “Christian Science Editorial Receives an Apt Answer,” Christian Science Sentinel 4 (September 5, 1901): 6-7; Clarence A. Buskirk, “A Demand for Fair Play,” Christian Science Sentinel 4 (October 3, 1901): 67-68; Clarence A. Buskirk, “Mrs. Eddy as Author,” The Christian Science Journal 19 (January 1902): 658-662; Clarence A. Buskirk, “Christian Science as a Religion,” Christian Science Sentinel 4 (January 23, 1902): 327-328; Clarence A. Buskirk, “Reply to Rev. Dr. Waterman,” Christian Science Sentinel 4 (April 3, 1902): 489-490; Clarence A. Buskirk, “Christian Science and Suggestive Therapeutics,” Christian Science Sentinel 4 (June 5, 1902): 635-636; Clarence A. Buskirk, “Right View of Atonement,” Christian Science Sentinel 5 (December 18, 1902): 245; and Clarence A. Buskirk, “A Reply in Explanation,” Christian Science Sentinel 5 (February 26, 1903): 408-409. Legislation limiting the practice of Christian Science was springing up throughout many parts of the United States at this time. For more information, see “Legislation in Indiana,” Christian Science Sentinel 3 (March 28, 1901): 477-480, and “Religious Liberty,” The Christian Science Journal 19 (May 1901): 133-140. “Legislation in Indiana,” Christian Science Sentinel 3 (March 28, 1901): 477-480. The men opposed to the Bill were defending the Constitution of Indiana, Article I, Bill of Rights, which at that time read in part, “We declare that all men are created equal; that they are endowed with certain inalienable rights; that among these are life, liberty, and the pursuit of happiness. . . . All men should be secured in their natural right to worship God according to the dictates of their own consciences. . . . No law shall, in any case whatever, control the free exercise and enjoyment of religious opinions, or interfere with the rights of conscience.” “The Indiana Bill,” Christian Science Sentinel 3 (April 4, 1901): 492-494. “Legislation in Indiana,” Christian Science Sentinel 3 (March 28, 1901): 477-480. “The Indiana Bill,” Christian Science Sentinel 3 (April 4, 1901): 492-494. For another example of Mr. Buskirk’s efforts to stay restrictive legislation, see Clarence A. Buskirk, “Christian Science and Materia Medica,” The Christian Science Journal 24 (September 1906): 321-327. “Courts Sustain Christian Science Practice,” Christian Science Sentinel 6 (December 19, 1903): 248. His defense would be reprinted in the Sentinel. Clarence A. Buskirk, “A Choice of Means,” Christian Science Sentinel 6 (October 10, 1903): 86. 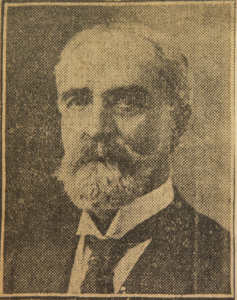 Buskirk’s comments were sent to the Editors, who published them in the Sentinel. See “Courts Sustain Christian Science Practice,” Christian Science Sentinel 6 (December 19, 1903): 248. 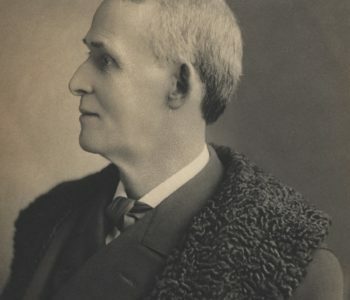 Clarence published three books: Fragments of Essays: and Other Verses, a fable told in rhyme (1880); the 93-page poem A Cavern for a Hermitage (1889); and The Great Interrogations (1897). 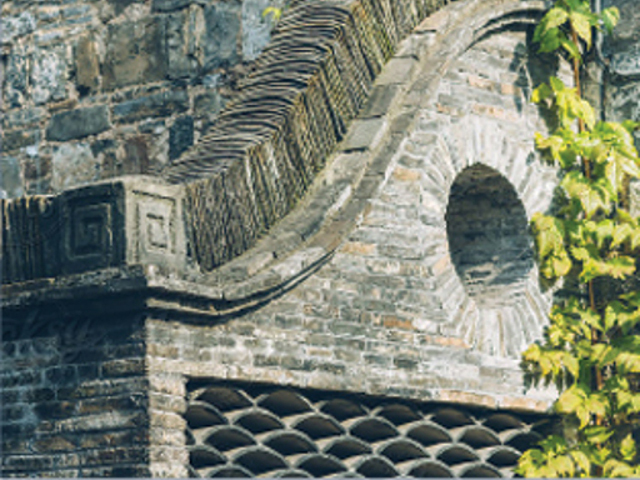 In a book highlighting American poets of the day, an excerpt from A Cavern for a Hermitage was included and received this compliment from the author: “Although a poem of some length, the frequent change of meter prevents sameness. The story is ingenious, the meditations are deeply philosophical, which together with the richness of its rhythm, proves very interesting.” Thomas W. Herringshaw, Local and National Poets of America (Chicago: American Publishers’ Association, 1890), 341. This poem was published in the Christian Science Sentinel. See Clarence A. Buskirk, “The Dedication to Divine Love,” Christian Science Sentinel 8 (June 16, 1906): 662. Mary Baker Eddy to Clarence A. Buskirk, June 24, 1906, L18647, MBEL. 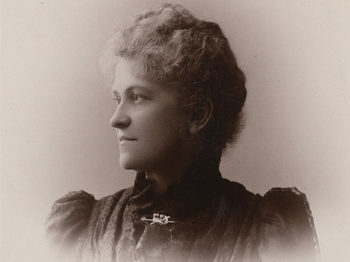 Her letter also noted, “Your article, Christianity the Gospel of Divine Love, lifted the curtain for lookers on and they could not fail to see its logic, rhetoric and meaning—just what is needed today.” She would praise Clarence for other articles he wrote for the Christian Science periodicals as well. For instance, after reading “Our Text-Book and its Teaching,” published in the January 1907 Journal, she called it “a masterly, profound article showing the scholar and the Christian Scientist beyond a question. . . . Accept my deep thanks for all you are effecting by these writings. . . .” Mary Baker Eddy to Clarence A. Buskirk, January 16, 1907, L15673, MBEL. Clarence A. Buskirk to Mary Baker Eddy, June 28, 1906, 046.15.006, MBEL. When Mrs. Eddy realized that Clarence’s formal title included “Honorable,” she never addressed him otherwise, and she requested that others do the same. See Mary Baker Eddy to Clarence A. Buskirk, February 15, 1905, L08345, MBEL; and Mary Baker Eddy to Editors/The Christian Science Board of Directors, May 23, 1905, L00416, MBEL. Clarence A. Buskirk to Mary Baker Eddy, April 15, 1904, 046.15.001, MBEL. Three days later Mrs. Eddy wrote the Board of Directors about Clarence’s election to the Board of Lectureship, concluding, “I think he will honor our Cause if elected.” Mary Baker Eddy to the Christian Science Board of Directors, April 18, 1904, L00381, MBEL. Mary Baker Eddy/George H. Kinter to Clarence A. Buskirk, June 18, 1904, L08125, MBEL. Clarence A. Buskirk to Mary Baker Eddy, June 15, 1904, 046.15.002, MBEL. Written on October 14, 1904, this statement was published in the October 19, 1907 Christian Science Sentinel and the November 1907 Journal. It was later republished in Miscellany, 296. For Mrs. Eddy’s approval and recommendation of Buskirk as a lecturer, see William B. Johnson to Mary Baker Eddy, October 3, 1905, L00442, MBEL; William B. Johnson/The Christian Science Board of Directors to Mary Baker Eddy, December 16, 1905, L00450, MBEL; William B. Johnson to Mary Baker Eddy, April 6, 1908, L00569, MBEL; Mary Baker Eddy to the Christian Science Board of Directors, October 31, 1908, L03202, MBEL. See “Letters to Our Leader,” Christian Science Sentinel 10 (November 9, 1907): 192 for Clarence’s response to her note published in the periodicals. Mary Baker Eddy to Clarence A. Buskirk, January 26, 1905, L08344, MBEL. Clarence A. Buskirk to Mary Baker Eddy, September 11, 1905, 046.15.005, MBEL. In October 1906, Clarence reported on a lecture circuit of 28 lectures in two and a half months. Clarence A. Buskirk to Mary Baker Eddy, October 29, 1906, 046.15.007, MBEL. “Letters to Our Leader,” Christian Science Sentinel 9 (May 11, 1907): 683. A month later, while still on a lecture tour, Clarence wrote to Mrs. Eddy: “In my opinion, based on what I have learned by a most careful observation in these extensive itineraries, the attacks which have been directed against Christian Science and its Founder and Leader have wholly miscarried of their purpose. . . . Everywhere I have found two significant manifestations, viz., A greater zeal on the part of your followers; and an awakened sense of fair play and a desire to investigate fairly from its own view-point the vital teachings of Christian Science, on the part of those who have heretofore given little or no heed to the subject.” “Letters to Our Leader,” The Christian Science Journal 25 (June 1907): 170-171. Clarence A. Buskirk to Mary Baker Eddy, November 10, 1907, 046.15.012, MBEL. “Letters to Our Leader,” Christian Science Sentinel 10 (November 23, 1907): 232. Frederick Dixon, “In London, England,” Christian Science Sentinel 10 (November 16, 1907): 209. Clarence returned the following year to lecture in Europe. The lecture he delivered in Brighton, England in 1908 was attended by 2,000 people, and the lecture given in Berlin, Germany attracted over 700. “The Lectures,” Christian Science Sentinel 10 (January 11, 1908): 368, and “The Lectures,” Christian Science Sentinel 10 (January 18, 1908): 388. Ella Buskirk to Mary Baker Eddy, March 26, 1907, 653.68.014, MBEL. Clarence A. Buskirk, “A Letter from Mr. Buskirk,” Christian Science Sentinel 18 (May 20, 1916): 751-752.